4 Bedroom Semi Detached House For Sale in Durham for Offers in the region of £285,000. 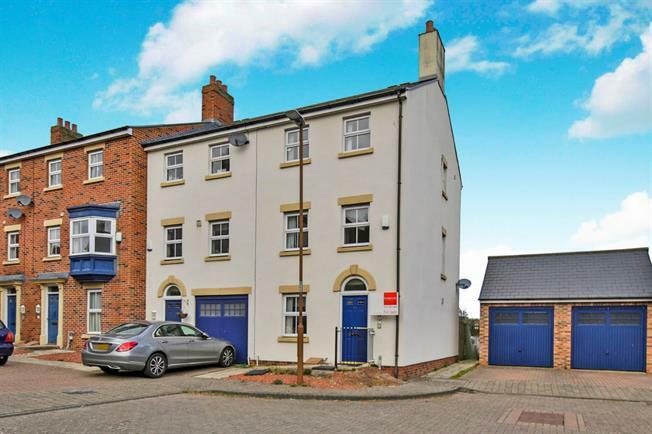 Modern town house set over three floors, with a detached garage. One of the more rare layouts of the estate, the floor plan is well laid out and makes use of the space perfectly. To the ground floor is a reception room/bedroom, utility room, ground floor WC and a spacious kitchen. The kitchen leads to a well maintained garden and side access provides a route to the driveway and garage. To the first floor there is an impressive lounge, and additional reception room/bedroom. The top floor comprises two bedrooms and two bathrooms. This house is offered for sale with no onward chain, and would be ideal for families looking to be close to the city, or investors looking to make use of the buoyant rental market in Durham.